For those of you have been in the sous vide game for awhile, what are some tips, tricks, and need-to-know bits of information for those who are brand new to sous vide cooking? 1) It's thickness that determines the time, not weight. We all start from somewhere! Variability of timing is another one that is difficult to get the head around. Why do instructions tend to give such a wide range of cooking times for sous vide recipes? As @AlyssaWOAH suggests, thickness impacts cook time more than weight does. A thicker piece of meat will take longer to reach temperature equilibrium than will a thinner piece. When cooking a steak, the time range is usually given as between 1 to 4 hours. A rule of thumb for calculating how long to achieve equilibrium is half an inch per half hour. So, a 1" thick steak will take about an hour to reach temperature in the middle. (Yes, the temperature travels from both sides of the steak. It travels at about half of the rule speed from all sides.) This would be the minimum time. The maximum time given is related to food safety. As steaks are often cooked below pasteurisation temperature (54C/129F) 4 hours is the maximum time that they should spend in the cooking bath. It's often stated that you can't overcook with sous vide. This statement is both true and not quite right at the same time. Specifically I'm talking about proteins as I've not experimented enough with vegies yet. As you're working at temperature equilibrium the product can never get higher in temperature than the water bath. So, in this respect it is true that you can't overcook. The temperature you set your water bath will be the temperature of your product. Where the overcook potential does come into it is texture. As temperature selects the done-ness of a piece of meat, cooking time selects the texture. This, to me, is the real beauty of sous vide cooking. You can take a cheaper secondary cut of meat, which is has the amazing flavour only possible in a well worked muscle, and cook it to the buttery tenderness of the most expensive piece of filet steak while still having it done to your favourite medium rare. Tenderness is achieved by the breakdown of collagen. At 54C/129F this will start to happen about 6 hours into the cook. That conversion will keep going until all collagen has been converted into gelatin. This is where the 'overcook' possibility comes into it. While you can achieve the most delightful textures, anywhere from the 'chew' of a good steak to the fall apart texture of a traditional braise, it is possible to take the conversion process too far and finish up with an unpleasant mushiness. Experimentation and experience are needed to know when to stop to achieve the texture you desire. It's a good idea to record your experiments so that when you find the perfect time and temperature for a certain product you can be sure to achieve it again and again. Thank you, @Ember. Your tips are always helpful. My tip is on searing. When I first started I was almost paranoid that searing would overcook my meats. What I now do is to cook my proteins a degree or so under where I want it to end up. I then remove it from the bag and dry it thoroughly. I then sear a little longer making sure I get the sides as well. Basting wiht butter at the end is also a nice touch. Especially on thicker steaks they are not as sensitive as I once thought. My tip: youtube.com is your friend! There are countless videos of people doing various things with sous vide and you can find just about any variation and meal that you can imagine. My favorite is the "Sous vide Everything" series. It's three friends who do literally that--they sous vide all sorts of meats, fish, vegetables, etc. Even more interesting is the various side-by-side tests they do, such as preparing the same cuts of meat with three different toppings, comparing searing tools and methods, different temps, etc. My favorite takeaway is my new go-to method of searing--using a flamethrower! It's really just a weed killer attachment for a propane tank but it beats the hell out of pan searing, grilling, or even the SearzAll. Not everything warrants a direct flame and should use a cast iron pan, but for everything else-- Flame On! Trust your nose, not so much your eyes. When cooking meat, especially red meat, you can get a grayish to greenish tinge to the product. There is a long involved bio-chemical explanation for it that I currently forget, but the bottom line is it happens and is somewhat common. Smell will be a lot more indicative if you have a problem. If you open up that bag and it'll stop a train, regardless of how pretty it is, you got a, problem. Do to the fact that you're cooking to pasteurize (usually) there isn't much of a chance of a microbial mishap, but they do happen from time to time. I bought a plate of spare ribs, cooked them up, opened up the bag and immediately wished I hadn't. it happens sometimes. Be safe and good luck! The green tinge is caused by the breakdown of myoglobin and harmless as you say. The sniff test is your friend. Any 'off' aromas are likely due to autolysis and are a sign something has gone wrong. If something doesn't smell right discard it. Someone may tell you that they "can't cook" but really what this translates to is they bought a cheap pots/pans set. The Clad cookware is night and day difference in terms of your results, like not burning eggs and them not sticking to the pan, braised dinners turning out good without burning, etc. IOW, get quality cookware on the cheap (reasonable quality / last), much like clothing. In that regard, Anova Sous Vide circulator is worlds better than the Euro water bath appliance I started with (b/c of water circulation and target temperature control). It excels at long cooks (Coleman cooler mods to fit) and is a low learning curve. You DO need to sear after a Sous Vide cook - it will turn out terrible otherwise. Searing is a 2min investment - sous vide is a huge time saver when set up properly for consumer home cooks. Not expensive and with some trivial initial time investment you will grok Sous Vide and it will be a regular in your cooking arsenal. After several initial missteps, I've discovered it's that good. Not unused counter space (in fact I use a separate room entirely). If you are sous vide-ing in a pot on a countertop other than wood, ALWAYS, ALWAYS, ALWAYS use a trivet or some other device to maintain an air gap between the bottom of the pot and the surface of the counter. Otherwise you risk cracking the countertop. A towel or oven mitt will not be sufficient. I actually cracked a high tech glass countertop while staying at an Air B&B in Vancouver CA last fall that cost me nearly $3000 to replace. Period expensive lesson! Ahhhhhhh yeah. Protecting your countertops is super important. I usually use a cutting board that has a couple of thick kitchen towels laying above it. To me it's all about the vacuum sealing, I found that cooking with vacuum bags helps me preserve the flavor of the meat / fish or anything else I'm "Sous Viding". My main problem with that was the I didn't want to invest tons of money on the electric vacuum sealer so I found a different way to vacuum bags. 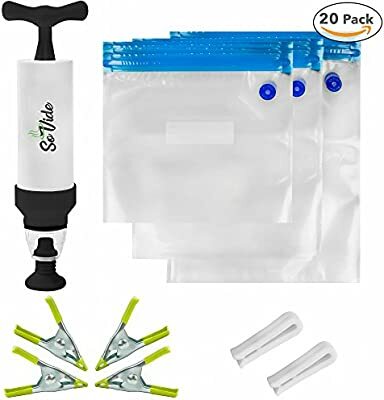 How do you vacuum seal the bags? I bought a vacuum sealer (a Luvele Supreme, which I'm very happy with). What prompted the purchase was sous vide, and I use it for that all the time. I know the advertising says that these bags are reusable, but it is not recommended to reuse plastic bags that have been used for meat products without some fairly strict hygiene protocols. Couldn't agree more, so what I do is I put Vinegar and Soap, seal the bag and let it sit for 10-20 min and then wash it. Not sure that that's sufficient that your routine is sufficient for destroying botulinum, which is hard to kill. Most of the others would be destroyed during the sous vide process if you're cooking long enough for pasteurisation.